These highlights do not include all the information needed to use VOLTAREN GEL safely and effectively. See full prescribing information for VOLTAREN GEL. Nonsteroidal anti-inflammatory drugs (NSAIDs) cause an increased risk of serious cardiovascular thrombotic events, including myocardial infarction and stroke, which can be fatal. This risk may occur early in treatment and may increase with duration of use [see Warnings and Precautions (5.1)]. VOLTAREN GEL is contraindicated in the setting of coronary artery bypass graft (CABG) surgery [see Contraindications (4) and Warnings and Precautions (5.1)]. NSAIDs cause an increased risk of serious gastrointestinal (GI) adverse events including bleeding, ulceration, and perforation of the stomach or intestines, which can be fatal. These events can occur at any time during use and without warning symptoms. Elderly patients and patients with a prior history of peptic ulcer disease and/or GI bleeding are at greater risk for serious GI events [see Warnings and Precautions (5.2)]. VOLTAREN GEL is indicated for the relief of the pain of osteoarthritis of joints amenable to topical treatment, such as the knees and those of the hands. VOLTAREN GEL has not been evaluated for use on the spine, hip, or shoulder. 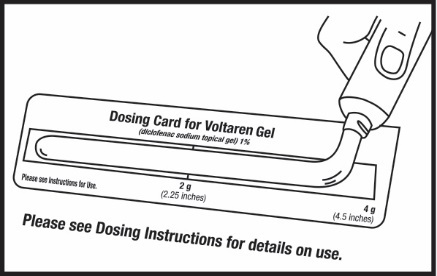 The proper amount of VOLTAREN GEL should be measured using the dosing card supplied in the drug product carton. The dosing card is made of clear plastic. The dosing card should be used for each application of drug product. 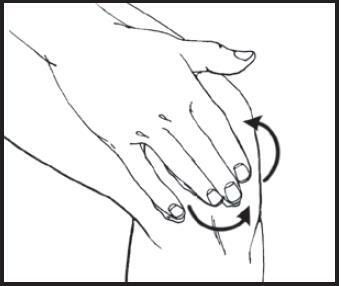 The gel should be applied within the rectangular area of the dosing card up to the 2 gram or 4 gram line (2 g for each elbow, wrist, or hand, and 4 g for each knee, ankle, or foot). The 2 g line is 2.25 inches long. The 4 g line is 4.5 inches long. The dosing card containing VOLTAREN GEL can be used to apply the gel. The hands should then be used to gently rub the gel into the skin. After using the dosing card, hold with fingertips, rinse, and dry. If treatment site is the hands, patients should wait at least one (1) hour to wash their hands. Apply the gel (4 g) to the affected foot, ankle, or knee 4 times daily. VOLTAREN GEL should be gently massaged into the skin ensuring application to the entire affected foot, or knee or ankle. The entire foot includes the sole, top of the foot, and the toes. Do not apply more than 16 g daily to any single joint of the lower extremities. Apply the gel (2 g) to the affected hand, wrist, or elbow 4 times daily. VOLTAREN GEL should be gently massaged into the skin ensuring application to the entire affected hand, wrist, or elbow. The entire hand includes the palm, back of the hands, and the fingers. Do not apply more than 8 g daily to any single joint of the upper extremities. Avoid showering/bathing for at least 1 hour after the application. 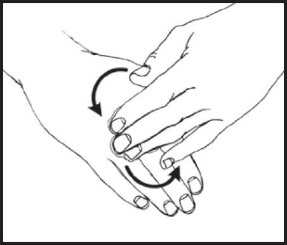 Inform patient to wash their hands after use, unless the hands are the treated joint. If VOLTAREN GEL is applied to the hand(s) for treatment; inform patient not to wash the treated hand(s) for at least 1 hour after the application. Do not apply VOLTAREN GEL to open wounds. Avoid contact of VOLTAREN GEL with eyes and mucous membranes. Avoid concomitant use of VOLTAREN GEL on the treated skin site with other topical products, including sunscreens, cosmetics, lotions, moisturizers, insect repellants, or other topical medications. Concomitant use of VOLTAREN GEL with oral nonsteroidal anti-inflammatory drugs (NSAIDs) has not been evaluated, and may increase adverse NSAIDs effects. Do not use combination therapy with VOLTAREN GEL and an oral NSAID unless the benefit outweighs the risk and conduct periodic laboratory evaluations. Avoid wearing of clothing or gloves for at least 10 minutes after applying VOLTAREN GEL. History of asthma, urticaria, or other allergic-type reactions after taking aspirin or other NSAIDs. Severe, sometimes fatal, anaphylactic reactions to NSAIDs have been reported in such patients [see Warnings and Precautions (5.7, 5.8)]. There is no consistent evidence that concurrent use of aspirin mitigates the increased risk of serious CV thrombotic events associated with NSAID use. The concurrent use of aspirin and an NSAID, such as diclofenac, increases the risk of serious gastrointestinal (GI) events [see Warnings and Precautions (5.2)]. Two large, controlled clinical trials of a COX-2 selective NSAID for the treatment of pain in the first 10-14 days following CABG surgery found an increased incidence of myocardial infarction and stroke. NSAIDs are contraindicated in the setting of CABG [see Contraindications (4)]. Avoid the use of VOLTAREN GEL in patients with a recent MI unless the benefits are expected to outweigh the risk of recurrent CV thrombotic events. If VOLTAREN GEL is used in patients with a recent MI, monitor patients for signs of cardiac ischemia. NSAIDs, including diclofenac, cause serious gastrointestinal (GI) adverse events including inflammation, bleeding, ulceration, and perforation of the esophagus, stomach, small intestine, or large intestine, which can be fatal. These serious adverse events can occur at any time, with or without warning symptoms, in patients treated with NSAIDs. Only one in five patients who develop a serious upper GI adverse event on NSAID therapy is symptomatic. Upper GI ulcers, gross bleeding, or perforation caused by NSAIDs occurred in approximately 1% of patients treated for 3-6 months, and in about 2%-4% of patients treated for one year. However, even short-term NSAID therapy is not without risk. If a serious GI adverse event is suspected, promptly initiate evaluation and treatment, and discontinue VOLTAREN GEL until a serious GI adverse event is ruled out. In clinical trials, of oral diclofenac-containing products, meaningful elevations (i.e. more than 3 times the ULN) of AST (SGOT) were observed in about 2% of approximately 5,700 patients at some time during diclofenac treatment (ALT was not measured in all studies). In a large, open-label, controlled trial of 3,700 patients treated with oral diclofenac sodium for 2-6 months, patients were monitored first at 8 weeks and 1,200 patients were monitored again at 24 weeks. Meaningful elevations of ALT and/or AST occurred in about 4% of 3,700 patients and included marked elevations (greater than 8 times the ULN) in about 1% of the 3,700 patients. In that open-label study, a higher incidence of borderline (less than 3 times the ULN), moderate (3-8 times the ULN), and marked (greater than 8 times the ULN) elevations of ALT or AST was observed in patients receiving diclofenac when compared to other NSAIDs. Elevations in transaminases were seen more frequently in patients with osteoarthritis than in those with rheumatoid arthritis. If abnormal liver tests persist or worsen, if clinical signs and/or symptoms consistent with liver disease develop, or if systemic manifestations occur (e.g., eosinophilia, rash, abdominal pain, diarrhea, dark urine, etc. ), VOLTAREN GEL should be discontinued immediately. Inform patients of the warning signs and symptoms of hepatotoxicity (e.g., nausea, fatigue, lethargy, diarrhea, pruritus, jaundice, right upper quadrant tenderness, and "flu-like" symptoms). If clinical signs and symptoms consistent with liver disease develop, or if systemic manifestations occur (e.g., eosinophilia, rash, etc. ), discontinue VOLTAREN GEL immediately, and perform a clinical evaluation of the patient. To minimize the potential risk for an adverse liver related event in patients treated with VOLTAREN GEL, use the lowest effective dose for the shortest duration possible. Exercise caution when prescribing VOLTAREN GEL with concomitant drugs that are known to be potentially hepatotoxic (e.g., acetaminophen, antibiotics, anti-epileptics). NSAIDs, including VOLTAREN GEL, can lead to new onset of hypertension or worsening of preexisting hypertension, either of which may contribute to the increased incidence of CV events. Patients taking angiotensin converting enzyme (ACE) inhibitors, thiazide diuretics, or loop diuretics may have impaired response to these therapies when taking NSAIDs [see Drug Interactions (7)]. Additionally, fluid retention and edema have been observed in some patients treated with NSAIDs. Use of diclofenac may blunt the CV effects of several therapeutic agents used to treat these medical conditions (e.g., diuretics, ACE inhibitors, or angiotensin receptor blockers [ARBs]) [see Drug Interactions (7)]. Avoid the use of VOLTAREN GEL in patients with severe heart failure unless the benefits are expected to outweigh the risk of worsening heart failure. If VOLTAREN GEL is used in patients with severe heart failure, monitor patients for signs of worsening heart failure. No information is available from controlled clinical studies regarding the use of VOLTAREN GEL in patients with advanced renal disease. The renal effects of VOLTAREN GEL may hasten the progression of renal dysfunction in patients with preexisting renal disease. Correct volume status in dehydrated or hypovolemic patients prior to initiating VOLTAREN GEL. Monitor renal function in patients with renal or hepatic impairment, heart failure, dehydration, or hypovolemia during use of VOLTAREN GEL [see Drug Interactions (7)]. Avoid the use of VOLTAREN GEL in patients with advanced renal disease unless the benefits are expected to outweigh the risk of worsening renal function. If VOLTAREN GEL is used in patients with advanced renal disease, monitor patients for signs of worsening renal function. Diclofenac has been associated with anaphylactic reactions in patients with and without known hypersensitivity to diclofenac and in patients with aspirin-sensitive asthma [see Contraindications (4) and Warnings and Precautions (5.8)]. A subpopulation of patients with asthma may have aspirin-sensitive asthma which may include chronic rhinosinusitis complicated by nasal polyps; severe, potentially fatal bronchospasm; and/or intolerance to aspirin and other NSAIDs. Because cross-reactivity between aspirin and other NSAIDs has been reported in such aspirin-sensitive patients, VOLTAREN GEL is contraindicated in patients with this form of aspirin sensitivity [see Contraindications (4)]. When VOLTAREN GEL is used in patients with preexisting asthma (without known aspirin sensitivity), monitor patients for changes in the signs and symptoms of asthma. NSAIDs, including diclofenac, can cause serious skin adverse reactions such as exfoliative dermatitis, Stevens-Johnson Syndrome (SJS), and toxic epidermal necrolysis (TEN), which can be fatal. These serious events may occur without warning. Inform patients about the signs and symptoms of serious skin reactions, and to discontinue the use of VOLTAREN GEL at the first appearance of skin rash or any other sign of hypersensitivity. VOLTAREN GEL is contraindicated in patients with previous serious skin reactions to NSAIDs [see Contraindications (4)]. Diclofenac may cause premature closure of the fetal ductus arteriosus. Avoid use of NSAIDs, including VOLTAREN GEL, in pregnant women starting at 30 weeks of gestation (third trimester) [see Use in Specific Populations (8.1)]. Anemia has occurred in NSAID-treated patients. This may be due to occult or gross blood loss, fluid retention, or an incompletely described effect on erythropoiesis. If a patient treated with VOLTAREN GEL has any signs or symptoms of anemia, monitor hemoglobin or hematocrit. NSAIDs, including VOLTAREN GEL, may increase the risk of bleeding events. Co-morbid conditions such as coagulation disorders, concomitant use of warfarin, other anticoagulants, antiplatelet agents (e.g., aspirin), serotonin reuptake inhibitors (SSRIs) and serotonin norepinephrine reuptake inhibitors (SNRIs) may increase this risk. Monitor these patients for signs of bleeding [see Drug Interactions (7)]. The pharmacological activity of VOLTAREN GEL in reducing inflammation, and possibly fever, may diminish the utility of diagnostic signs in detecting infections. Patients should minimize or avoid exposure to natural or artificial sunlight on treated areas because studies in animals indicated topical diclofenac treatment resulted in an earlier onset of ultraviolet light induced skin tumors. The potential effects of VOLTAREN GEL on skin response to ultraviolet damage in humans are not known. Contact of VOLTAREN GEL with eyes and mucosa, although not studied, should be avoided. Patients should be advised that if eye contact occurs, they should immediately wash out the eye with water or saline and consult a physician if irritation persists for more than an hour. Concomitant use of oral and topical NSAIDs may result in a higher rate of hemorrhage, more frequent abnormal creatinine, urea, and hemoglobin. Do not use combination therapy with VOLTAREN GEL and an oral NSAID unless the benefit outweighs the risk. During clinical development, 913 patients were exposed to VOLTAREN GEL in randomized, double-blind, multicenter, vehicle-controlled, parallel-group studies in osteoarthritis of the superficial joints of the extremities. Of these, 513 patients received VOLTAREN GEL for osteoarthritis of the knee and 400 were treated for osteoarthritis of the hand. Additionally, 583 patients were exposed to VOLTAREN GEL in an uncontrolled, open-label, long-term safety trial in osteoarthritis of the knee. Of these, 355 patients were treated for osteoarthritis of 1 knee and 228 were treated for osteoarthritis of both knees. Duration of exposure ranged from 8 to 12 weeks for the placebo-controlled studies, and up to 12 months for the open-label safety trial. Adverse reactions observed in at least 1% of patients treated with VOLTAREN GEL: Non-serious adverse reactions that were reported during the short-term placebo-controlled studies comparing VOLTAREN GEL and placebo (vehicle gel) over study periods of 8 to 12 weeks (16 g per day), were application site reactions. These were the only adverse reactions that occurred in >1% of treated patients with a greater frequency in the VOLTAREN GEL group (7%) than the placebo group (2%). Table 1 lists the types of application site reactions reported. Application site dermatitis was the most frequent type of application site reaction and was reported by 4% of patients treated with VOLTAREN GEL, compared to 1% of placebo patients. In the placebo-controlled trials, the discontinuation rate due to adverse reactions was 5% for patients treated with VOLTAREN GEL, and 3% for patients in the placebo group. Application site reactions, including application site dermatitis, were the most frequent reason for treatment discontinuation. In the open-label, long-term safety study, distribution of adverse reactions was similar to that in the placebo-controlled studies. In this study, where patients were treated for up to 1 year with VOLTAREN GEL up to 32 g per day, application site dermatitis was observed in 11% of patients. Adverse reactions that led to the discontinuation of the study drug were experienced in 12% of patients. The most common adverse reaction that led to discontinuation of the study was application site dermatitis, which was experienced by 6% of patients. Monitor patients with concomitant use of VOLTAREN GEL with anticoagulants (e.g., warfarin), antiplatelet agents (e.g., aspirin), selective serotonin reuptake inhibitors (SSRIs), and serotonin norepinephrine reuptake inhibitors (SNRIs) for signs of bleeding [see Warnings and Precautions (5.11)]. Controlled clinical studies showed that the concomitant use of NSAIDs and analgesic doses of aspirin does not produce any greater therapeutic effect than the use of NSAIDs alone. In a clinical study, the concomitant use of an NSAID and aspirin was associated with a significantly increased incidence of GI adverse reactions as compared to use of the NSAID alone [see Warnings and Precautions (5.2)]. Concomitant use of VOLTAREN GEL and analgesic doses of aspirin is not generally recommended because of the increased risk of bleeding [see Warnings and Precautions (5.11)]. VOLTAREN GEL is not a substitute for low dose aspirin for cardiovascular protection. NSAIDs may diminish the antihypertensive effect of angiotensin converting enzyme (ACE) inhibitors, angiotensin receptor blockers (ARBs), or beta-blockers (including propranolol). In patients who are elderly, volume-depleted (including those on diuretic therapy), or have renal impairment, co-administration of an NSAID with ACE inhibitors or ARBs may result in deterioration of renal function, including possible acute renal failure. These effects are usually reversible. During concomitant use of VOLTAREN GEL and ACE-inhibitors, ARBs, or beta- blockers, monitor blood pressure to ensure that the desired blood pressure is obtained. During concomitant use of VOLTAREN GEL and ACE-inhibitors or ARBs in patients who are elderly, volume-depleted, or have impaired renal function, monitor for signs of worsening renal function [see Warnings and Precautions (5.6)]. Clinical studies, as well as postmarketing observations, showed that NSAIDs reduced the natriuretic effect of loop diuretics (e.g., furosemide) and thiazide diuretics in some patients. This effect has been attributed to the NSAID inhibition of renal prostaglandin synthesis. During concomitant use of VOLTAREN GEL with diuretics, observe patients for signs of worsening renal function, in addition to assuring diuretic efficacy including antihypertensive effects [see Warnings and Precautions (5.6)]. During concomitant use of VOLTAREN GEL and digoxin, monitor serum digoxin levels. During concomitant use of VOLTAREN GEL and lithium, monitor patients for signs of lithium toxicity. During concomitant use of VOLTAREN GEL and methotrexate, monitor patients for methotrexate toxicity. Concomitant use of VOLTAREN GEL and cyclosporine may increase cyclosporine's nephrotoxicity. During concomitant use of VOLTAREN GEL and cyclosporine, monitor patients for signs of worsening renal function. Concomitant use of diclofenac with other NSAIDs or salicylates (e.g., diflunisal, salsalate) increases the risk of GI toxicity, with little or no increase in efficacy [see Warnings and Precautions (5.2)]. Concomitant use of VOLTAREN GEL and pemetrexed may increase the risk of pemetrexed-associated myelosuppression, renal, and GI toxicity (see the pemetrexed prescribing information). During concomitant use of VOLTAREN GEL and pemetrexed, in patients with renal impairment whose creatinine clearance ranges from 45 to 79 mL/min, monitor for myelosuppression, renal and Gl toxicity. Use of NSAIDs, including VOLTAREN GEL, during the third trimester of pregnancy increases the risk of premature closure of the fetal ductus arteriosus. Avoid use of NSAIDs, including VOLTAREN GEL, in pregnant women starting at 30 weeks of gestation (third trimester). There are no adequate and well-controlled studies of VOLTAREN GEL in pregnant women. Human and animal studies indicate that diclofenac crosses the placenta. Data from observational studies regarding potential embryofetal risks of NSAID use in women in the first or second trimesters of pregnancy are inconclusive. In the general U.S. population, all clinically recognized pregnancies, regardless of drug exposure, have a background rate of 2-4% for major malformations, and 15-20% for pregnancy loss. In animal reproduction studies, no evidence of teratogenicity was observed in mice, rats, or rabbits given diclofenac during the period of organogenesis at doses up to approximately 5, 5, and 10 times, respectively, the maximum recommended topical dose of VOLTAREN GEL, despite the presence of maternal and fetal toxicity at these doses [see Data]. Based on animal data, prostaglandins have been shown to have an important role in endometrial vascular permeability, blastocyst implantation, and decidualization. In animal studies, administration of prostaglandin synthesis inhibitors such as diclofenac, resulted in increased pre- and post-implantation loss. There are no studies on the effects of VOLTAREN GEL during labor or delivery. In animal studies, NSAIDS, including diclofenac, inhibit prostaglandin synthesis, cause delayed parturition, and increase the incidence of stillbirth. Reproductive and developmental studies in animals demonstrated that diclofenac sodium administration during organogenesis did not produce teratogenicity despite the induction of maternal toxicity and fetal toxicity in mice at oral doses up to 20 mg/kg/day (approximately 5 times the maximum recommended human dose (MRHD) of VOLTAREN GEL based on bioavailability and body surface area (BSA) comparison), and in rats and rabbits at oral doses up to 10 mg/kg/day (approximately 5 and 10 times the MRHD based on bioavailability and BSA comparison). Based on available data, diclofenac may be present in human milk. The developmental and health benefits of breast-feeding should be considered along with the mother’s clinical need for CATAFLAM and any potential adverse effects on the breastfed infant from the CATAFLAM or from the underlying maternal condition. One woman treated orally with a diclofenac salt, 150 mg/day, had a milk diclofenac level of 100 µg/L, equivalent to an infant dose of about 0.03 mg/kg/day. Diclofenac was not detectable in breast milk in 12 women using diclofenac (after either 100 mg/day orally for 7 days or a single 50 mg intramuscular dose administered in the immediate postpartum period). Based on the mechanism of action, the use of prostaglandin-mediated NSAIDs, including VOLTAREN GEL, may delay or prevent rupture of ovarian follicles, which has been associated with reversible infertility in some women. Published animal studies have shown that administration of prostaglandin synthesis inhibitors has the potential to disrupt prostaglandin‑ mediated follicular rupture required for ovulation. Small studies in women treated with NSAIDs have also shown a reversible delay in ovulation. Consider withdrawal of NSAIDs, including VOLTAREN GEL, in women who have difficulties conceiving or who are undergoing investigation of infertility. Of the total number of subjects treated with VOLTAREN GEL in clinical studies, 498 were 65 years of age and over. No overall differences in effectiveness or safety were observed between these subjects and younger subjects, but greater sensitivity to the effect of NSAIDs in some older individuals cannot be ruled out. Diclofenac, as with any NSAID, is known to be substantially excreted by the kidney, and the risk of toxic reactions to VOLTAREN GEL may be greater in patients with impaired renal function. Because elderly patients are more likely to have decreased renal function, care should be taken when using VOLTAREN GEL in the elderly, and it may be useful to monitor renal function. For additional information about overdosage treatment, contact a Poison Control Center (1-800-222-1222). It contains the active ingredient, diclofenac sodium, in an opaque, white gel base. Diclofenac sodium is a white to slightly yellow crystalline powder. Diclofenac sodium is a benzeneacetic acid derivative. The inactive ingredients in VOLTAREN GEL include: carbomer homopolymer Type C, cocoyl caprylocaprate, fragrance, isopropyl alcohol, mineral oil, polyoxyl 20 cetostearyl ether, propylene glycol, purified water, and strong ammonia solution. The mechanism of action of VOLTAREN GEL, like that of other NSAIDs, is not completely understood but involves inhibition of cyclooxygenase (COX-1 and COX-2). The pharmacokinetics of VOLTAREN GEL were assessed in healthy volunteers following repeated applications during 7 days of VOLTAREN GEL to 1 knee (4 x 4 g per day) or to 2 knees and 2 hands (4 x 12 g per day) versus the recommended oral dose of diclofenac sodium for the treatment of osteoarthritis (3 x 50 mg per day). A summary of the pharmacokinetic parameters is presented in Table 3. Systemic exposure (area under the concentration-time curve) and maximum plasma concentrations of diclofenac are significantly lower with VOLTAREN GEL than with comparable oral treatment of diclofenac sodium. Systemic exposure with recommended use of VOLTAREN GEL (4 x 4 g per day applied to 1 knee) is on average 17 times lower than with oral treatment. (Basis: treatment with VOLTAREN GEL of 1 knee, 4 times a day versus 50 mg, 3 times a day of oral diclofenac tablets). The amount of diclofenac sodium that is systemically absorbed from VOLTAREN GEL is on average 6% of the systemic exposure from an oral form of diclofenac sodium. The average peak plasma concentration with recommended use of VOLTAREN GEL (4 x 4 g per day applied to 1 knee) is 158 times lower than with the oral treatment. The pharmacokinetics of VOLTAREN GEL has been tested under conditions of moderate heat (application of a heat patch for 15 minutes prior to gel application) and of moderate exercise (first gel application followed by a 20-minute treadmill exercise). No clinically relevant differences of systemic absorption and of tolerability were found between applications of VOLTAREN GEL (4 x 4 g per day on 1 knee) with and under the conditions tested. However, the pharmacokinetics of VOLTAREN GEL were not tested under the condition of heat application following gel application. Therefore, concurrent use of VOLTAREN GEL and heat is not recommended. Aspirin: When NSAIDs were administered with aspirin, the protein binding of NSAIDs were reduced, although the clearance of free NSAID was not altered. The clinical significance of this interaction is not known. See Table 2 for clinically significant drug interactions of NSAIDs with aspirin [see Drug Interactions (7)]. Carcinogenicity studies in mice and rats administered diclofenac sodium as a dietary constituent for 2 years at doses up to 2 mg/kg/day (approximately 0.5 and 1 times, respectively, the maximum recommended human topical dose of VOLTAREN GEL based on bioavailability and body surface area (BSA) comparison) resulted in no significant increases in tumor incidence. In a dermal carcinogenicity study conducted in albino mice, daily topical applications of a diclofenac sodium gel product for two years at concentrations up to 0.035% diclofenac sodium (a 29-fold lower diclofenac sodium concentration than present in VOLTAREN GEL) did not increase neoplasm incidence. In a photococarcinogenicity study conducted in hairless mice, topical application of a diclofenac sodium gel product at doses up to 0.035% diclofenac sodium (a 29-fold lower diclofenac sodium concentration than present in VOLTAREN GEL) resulted in an earlier median time of onset of tumors. Diclofenac did not affect male or female fertility in rats at doses up to 4 mg/kg/day (approximately 2 times than the maximum human topical dose of VOLTAREN GEL based on bioavailability and BSA comparison). Study 1 evaluated the efficacy of VOLTAREN GEL for the treatment of osteoarthritis of the knee in a 12-week, randomized, double-blind, multicenter, placebo-controlled, parallel-group trial. VOLTAREN GEL was administered at a dose of 4 g, 4 times daily, on 1 knee (16 g per day). Pain as assessed by the patients at Week 12 using the WOMAC (Western Ontario and McMaster Universities Osteoarthritis Index) Pain Subindex was lower in the VOLTAREN GEL group than the placebo group. Study 2 evaluated the efficacy of VOLTAREN GEL for the treatment of osteoarthritis in subjects with osteoarthritis of the hand in an 8-week, randomized, double-blind, multicenter, placebo-controlled, parallel-group study. VOLTAREN GEL was administered at a dose of 2 g per hand, 4 times daily, on both hands (16 g per day). Pain in the target hand as assessed by the patients at Weeks 4 and 6 on a visual analog scale from 0 to 100 was lower in the VOLTAREN GEL group than the placebo group. ‡ Difference is adjusted using an analysis of covariance (ANCOVA) model with main effects of treatment, center, indicator of pain in the CMC-1 joint, and baseline as a covariate, and the treatment-by-CMC-1 strata. VOLTAREN GEL (diclofenac sodium topical gel, 1%) is available in tubes containing 100 grams of the topical gel in each tube. Each tube contains diclofenac sodium in a gel base (10 mg of diclofenac sodium per gram of gel or 1%). Store at room temperature 68°F to 77°F (20°C to 25°C) [see USP Controlled Room Temperature]. Keep from freezing. Store the dosing card with your VOLTAREN GEL. Advise the patient to read the FDA-approved patient labeling (Medication Guide and Instructions for Use) that accompanies each prescription dispensed. Patients, families, or their caregivers should be informed of the following information before initiating therapy with VOLTAREN GEL and periodically during the course of ongoing therapy. Advise patients to be alert for the symptoms of cardiovascular thrombotic events, including chest pain, shortness of breath, weakness, or slurring of speech, and to report any of these symptoms to their healthcare provider immediately [see Warnings and Precautions (5.1)]. Advise patients to report symptoms of ulcerations and bleeding, including epigastric pain, dyspepsia, melena, and hematemesis to their healthcare provider. In the setting of concomitant use of low-dose aspirin for cardiac prophylaxis, inform patients of the increased risk for and the signs and symptoms of GI bleeding [see Warnings and Precautions (5.2)]. Inform patients of the warning signs and symptoms of hepatotoxicity (e.g., nausea, fatigue, lethargy, pruritus, diarrhea, jaundice, right upper quadrant tenderness, and “flu-like” symptoms). If these occur, instruct patients to stop VOLTAREN GEL and seek immediate medical therapy [see Warnings and Precautions (5.3)]. Advise patients to stop VOLTAREN GEL immediately if they develop any type of rash and to contact their healthcare provider as soon as possible [see Warnings and Precautions (5.9)]. Advise females of reproductive potential who desire pregnancy that NSAIDs, including VOLTAREN GEL, may be associated with a reversible delay in ovulation [see Use in Specific Populations (8.3)]. Inform pregnant women to avoid use of VOLTAREN GEL and other NSAIDs starting at 30 weeks gestation because of the risk of the premature closing of the fetal ductus arteriosus [see Warnings and Precautions (5.10) and Use in Specific Populations (8.1)]. Inform patients that the concomitant use of VOLTAREN GEL with other NSAIDs or salicylates (e.g., diflunisal, salsalate) is not recommended due to the increased risk of gastrointestinal toxicity, and little or no increase in efficacy [see Warnings and Precautions (5.2) and Drug Interactions (7)]. Alert patients that NSAIDs may be present in "over-the-counter" medications for treatment of colds, fever, or insomnia. Inform patients not to use low-dose aspirin concomitantly with VOLTAREN GEL until they talk to their healthcare provider [see Drug Interactions (7)]. Instruct patients to avoid contact of VOLTAREN GEL with the eyes and mucosa, although not studied, should be avoided. Advise patients that if eye contact occurs, immediately wash out the eye with water or saline and consult a physician if irritation persists for more than an hour [see Warnings and Precautions (5.15)]. Instruct patients how to use the dosing card to measure the proper dose of VOLTAREN GEL to apply. If the patient loses their dosing card, instruct them that they can call 1-855-297-3031 to request a replacement dosing card or ask their pharmacist for a new dosing card. Instruct patients how to correctly measure the 2.25 inches (2 g) dose or 4.5 inches (4 g) dose while waiting for a replacement dosing card [see Dosage and Administration (2.2)]. Instruct patients not to apply VOLTAREN GEL to open skin wounds, infections, inflammations, or exfoliative dermatitis, as it may affect absorption and tolerability of the drug. Instruct patients to avoid concomitant use of VOLTAREN GEL with other topical products, including sunscreens, cosmetics, lotions, moisturizers, and insect repellants. Concomitant use may result in skin reactions or change the absorption of VOLTAREN GEL. Instruct patients to minimize or avoid exposure of treated areas to natural or artificial sunlight [see Warnings and Precautions (5.14) and Dosage and Administration (2.4)]. Do not take NSAIDs right before or after a heart surgery called a “coronary artery bypass graft (CABG)". 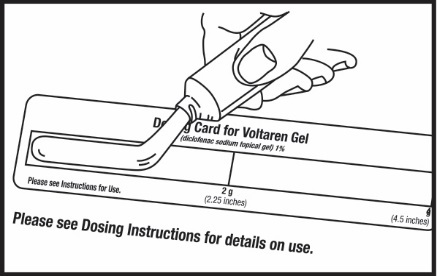 Important: Use the dosing card that is inside the VOLTAREN GEL carton to correctly measure each dose. The dosing card is re-usable. Do not throw the dosing card away. Before you use VOLTAREN GEL for the first time, your healthcare provider or pharmacist should show you how to correctly measure your dose using the dosing card. Read this Instructions for Use before you start using VOLTAREN GEL and each time you get a refill. There may be new information. This information does not take the place of talking to your healthcare provider about your medical condition or your treatment. Your healthcare provider has prescribed VOLTAREN GEL to help relieve arthritis pain in some of your joints. VOLTAREN GEL may be used to treat arthritis pain in the arms (hands, wrists, and elbows) and in the legs (feet, ankles, and knees). It is not known if VOLTAREN GEL is safe and effective if used on your spine, hips, or shoulders. Use VOLTAREN GEL exactly how your healthcare provider prescribes it for you. Do not apply VOLTAREN GEL anywhere other than where your healthcare provider tells you to. Do not use more than a total of 32 grams of VOLTAREN GEL each day. If you add up the amount of VOLTAREN GEL as directed by your healthcare provider, it should not be more than 32 grams in one day. The dose for your hands, wrists, or elbows is 2 grams of VOLTAREN GEL each time you apply it. Apply VOLTAREN GEL 4 times a day (a total of 8 grams each day). Do not apply more than 8 grams each day to any one of your affected hands, wrists, or elbows. The dose for your feet, ankles, or knees is 4 grams of VOLTAREN GEL each time you apply it. Apply VOLTAREN GEL 4 times a day (a total of 16 grams each day). Do not apply more than 16 grams each day to any one of your affected feet, ankles, or knees. If you use 2 grams of VOLTAREN GEL on one hand, 4 times a day, your total dose for one day is 8 grams. If you use 4 grams of VOLTAREN GEL on one knee, 4 times a day, your total dose for one day is 16 grams. Your total dose for one day, treating one hand and one knee, is 8 grams plus 16 grams, which equals 24 grams of VOLTAREN GEL. Before you use a new tube of VOLTAREN GEL for the first time: Unscrew cap and press the indent on the top of the cap (see Figure A) onto the star-shaped seal on the tube. 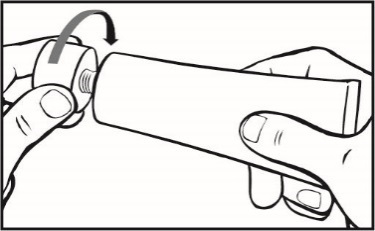 Firmly turn the cap to remove the safety seal (see Figure B). Take the cap off the tube. 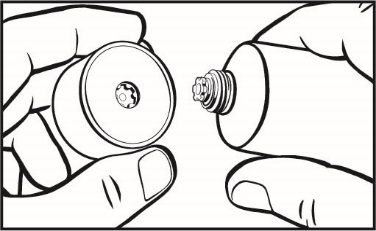 Open the safety seal by firmly pressing the indent on the top of the cap onto the star-shaped seal on the tube. Firmly turn the cap to remove the safety seal. Do not open the safety seal with scissors or other sharp objects. 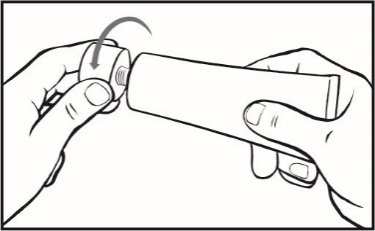 After use, put the cap back on the end of the tube and store in an upright position. 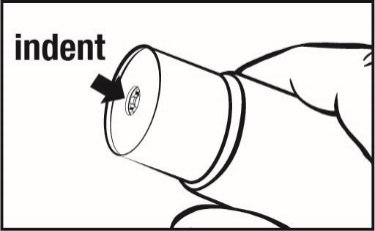 Remember to remove the dosing card from the carton to measure your dose (see Figure C). Apply VOLTAREN GEL to clean, dry skin that does not have any cuts, open wounds, infections, or rashes. Do not use heating pads or apply bandages to where you have applied VOLTAREN GEL. Avoid exposing skin where you apply VOLTAREN GEL to sunlight and artificial light, such as tanning booths. Do not use sunscreens, cosmetics, lotions, moisturizers, insect repellants, or other topical medicines on the same skin areas where you have applied VOLTAREN GEL. Do not get VOLTAREN GEL in your eyes, nose, or mouth. VOLTAREN GEL is only to be used on your skin (topical use). If you get VOLTAREN GEL in your eyes, rinse your eyes right away with water or saline. Talk with your healthcare provider if eye irritation lasts for more than one hour. If you miss a dose of VOLTAREN GEL, continue with your next scheduled dose using the prescribed amount of VOLTAREN GEL. Do not double the dose. Step 1. Remove the dosing card that is attached inside the VOLTAREN GEL carton. Use the dosing card to correctly measure each dose of VOLTAREN GEL. To measure the correct amount of VOLTAREN GEL, place the dosing card on a flat surface so that you can read the print. If the print is backwards, flip dosing card over (see Figure C). If you lose or misplace your dosing card, you can ask your pharmacist for a new one or call 1-855-297-3031. Ask your healthcare provider or pharmacist to show you how to correctly measure your dose of VOLTAREN GEL while you are waiting to receive your new dosing card. Step 2. Squeeze VOLTAREN GEL onto the dosing card evenly, up to the 2 g line (a 2.25 inch length of gel). Make sure that the gel covers the 2 g area of the dosing card (see Figure D). Put the cap back on the tube of VOLTAREN GEL. Ask your healthcare provider or pharmacist if you are not sure how to correctly measure your dose of VOLTAREN GEL. Step 3. Apply the gel to your hand, wrist, or elbow. You can use the dosing card to apply the gel (see Figure E). 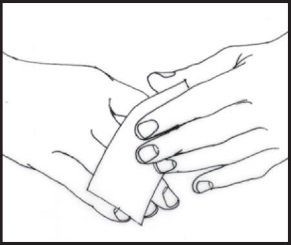 Then, use your hands to gently rub the gel into the skin (see Figure F). Do not share your dosing card with another person. Make sure to cover the entire affected hand, wrist, or elbow with the gel. Remember that the hand includes the palm of your hand, the top of your hand, and your fingers. Step 4. After using the dosing card, hold end with fingertips, rinse and dry. Store the dosing card until next use. Do not shower or bathe for at least 1 hour after applying VOLTAREN GEL. Do not wash your treated hands for at least 1 hour after applying the VOLTAREN GEL. Step 5. After applying VOLTAREN GEL, wait 10 minutes before covering the treated skin with gloves or clothing. Step 2. Squeeze VOLTAREN GEL onto the dosing card evenly up to the 4 g line (a 4.5 inch length of gel), making sure the gel covers the 4 g area of the dosing card (see Figure G). Put the cap back on the tube of VOLTAREN GEL. Ask your healthcare provider or pharmacist if you are not sure how to correctly measure your dose of VOLTAREN GEL. Step 3. Apply VOLTAREN GEL to your foot, ankle, or knee. You can use the dosing card to apply the gel (see Figure H). Then, use your hands to gently rub the gel into the skin (see Figure I). Do not share your dosing card with another person. Make sure to cover your entire foot, ankle, or knee area with the gel. For example, cover the skin above, below, inside, and outside the knee cap. Remember that the foot includes the sole of your foot, the top of your foot, and your toes. Refer to Steps 4 and 5 above. Wash your hands after applying VOLTAREN GEL to your foot, ankle, or knee. What are the ingredients in VOLTAREN GEL? How should I store VOLTAREN GEL? Do not freeze VOLTAREN GEL. Store the dosing card with your VOLTAREN GEL. Keep VOLTAREN GEL, the dosing card, and all medicines out of the reach of children.